Magnecor KV85 Ignition Cables are primarily designed to eliminate both EMI and RFI suppression problems resulting from the use of solid and mag style conductor ignition wires on vehicles utilizing high-output ignition systems together with sensitive on board electronic devices, including fuel, ignition and engine management systems, as well as radio and TV equipment. When used with high-output ignitions, exceptional ignition performance can be expected from domestic and foreign built race and modified engines using fuel injection, turbo charging, super charging and /or exotic fuels. 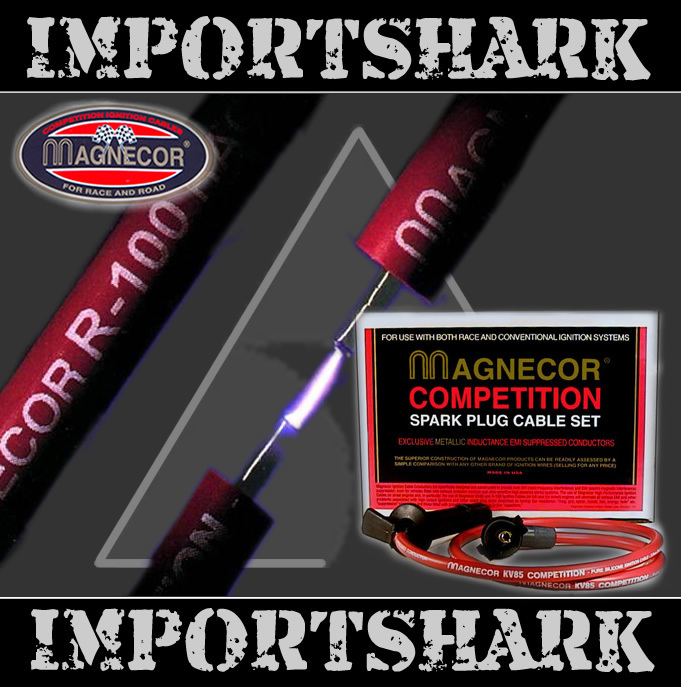 Magnecor KV85 Ignition Cables can also be used to advantage on engines fitted with exhaust emission controls, as well as marine engines, and severe load commercial vehicle engines particularly those using alternative fuels such as propane and natural gas with a history of persistent ignition lead failure. These engines will benefit from the ability of Magnecor Ignition Cables to conduct a high spark current at above and below normal operating temperatures. Specifications Outside Diameter of Cable: 8.5mm Color: Red Boot/Terminal Configuration: Various - to suit different domestic and foreign applications as well as customer special requirements. CABLE Construction Type: One piece, no cost saving layers used. Insulator Material: Extreme heat resistant TC-1500-HS high strength aerospace silicone rubber formulated to dissipate heat away from section exposed to high temperatures. Heat Resistance: 600oF (320oC) service temp. 1,000oF (540oC) short burst 3 minutes, Dielectric Strength: 60kv 260oC Flexibility & Strength: Extremely strong and flexible, can be fitted into OEM 7mm separators. Conductor Size: 2.50 mm in diameter. Conductor Type: Magnecor Metallic Inductance. RFI and EMI Suppressed. Core: Ferrimagnetic base Windings: 79 turns per cm (200 turns per inch). Windings Material: Stainless steel. Resistance: 72 ohm per cm, 2.2K ohm per ft. + 10%. Capacity: limited by jacket thickness to 60kV unless spaced. Spark Plug Terminals: Stainless steel snap-lock 180o bendable and fixed 90o styles. Distributor and Coil: Brass, stainless steel and beryllium snap-lock 180o and 90o styles. Spark Plug Boots: Silicone 320o C (600o F) - selection of straight, 45o and 90o styles used where applicable - special connector assemblies for some applications. Distributor and Coil: EPDM or Silicone - some sets will be fitted with OE style connectors. Shipping: These items ship factory direct, please allow 7-14 days for shipping.